«©NCSX» What do you get when you combine a Famicom (on a chip) and an Emulator? You get the Familator, which has been available from CyberGadget in a number of incarnations for a few years now. The Cyber Familator Lite is the latest model which interfaces with a Nintendo DS Lite to give retro gaming fans the ability to play Famicom cartridges directly on the DS. If you prefer playing games on a big screen television, the Familator can pipe composite video and monoaural audio through the AV cable that's included inside the package. Note however that you'll still control the game through the NDS' D-pad. There were/are solutions for playing Famicom games on the Nintendo DS and other platforms prior to CyberGadget's Familator Lite but we won't delve into them here. The Familator offers a legal and somewhat versatile way to play Famicom games without having to dig out a creaky Famicom console. We cracked open the package, unpacked the Familator and got acquainted with its parts and functions. Built-in speakers are located towards the front of the unit along with a volume slider, a headphone jack, a reset button, and a power LED. 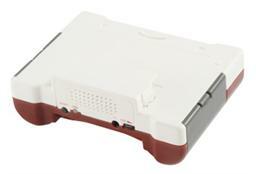 The back of the hardware features a Famicom cartridge slot and a proprietary AV output port. If you're a gamer on the go, the unit runs on four AA batteries for 4.5 hours of playing time. Keep an eye on the power LED because it'll shine blue when the batteries are fresh. As the batteries are drained of their power, the LED turns red to indicate that a battery swap is required. It's possible to use an AC adapter with the Familator but one isn't included. The AC adapter plug on the unit is also proprietary so you won't be able to run down to Radio Shack and grab any which one. The Familator interfaces with the Nintendo DS Lite through the handheld's Gameboy Advance cartridge slot. Once connected, the NDS sits right on top of the Familator and the combination looks like some kind of strange gaming sandwich of sorts. Built-in functions include a rapid-fire facility which is triggered by pressing the L or R triggers on the Nintendo DS Lite and the ability to adjust the brightness, contrast, and hue of the games being played on the Familator. Please note that the Familator requires that a Gameboy Advance cartridge be plugged into the front of the unit in order to operate. The GBA slot is located directly below the volume slider/headphone jack. Can I connect Famicom control pads to the Familator? No, the Familator does not sport any controller ports. You'll have to use the Nintendo DS Lite's D-pad to play the games. Will NDS games output to a television with the Familator installed? The video output function is only for Famicom games. Can I play Super Famicom cartridges on the Familator? Why would you want to indulge yourself with 16-bit masterpieces when you can be stuck with playing 8-bit games from way back in the day? In any case, the answer is no. I thought the Super Famicom and the Famicom were the same. Am I wrong? Affirmative. You're mistaken. The Famicom is Nintendo's 8-bit console hardware. The Super Famicom is Nintendo's 16-bit generation hardware. The two platforms are not compatible with each other. I have the original Nintendo DS unit. I can't get any Familator love? Unfortunately, the Familator is only compatible with the Nintendo DS Lite due to the shape of the interface that the NDS Lite plugs into. Will NCS stock the other versions of the Familator such as the self-contained units? Been there, done that. At least in a wholesale distribution capacity. Sales weren't that great back then and the expected sales volume now wouldn't be enough for us to justify another foray.